Serta has long been a trusted name when it comes to a good night’s rest. That tradition continues with the company’s iComfort SmartSupport™ line of beds. 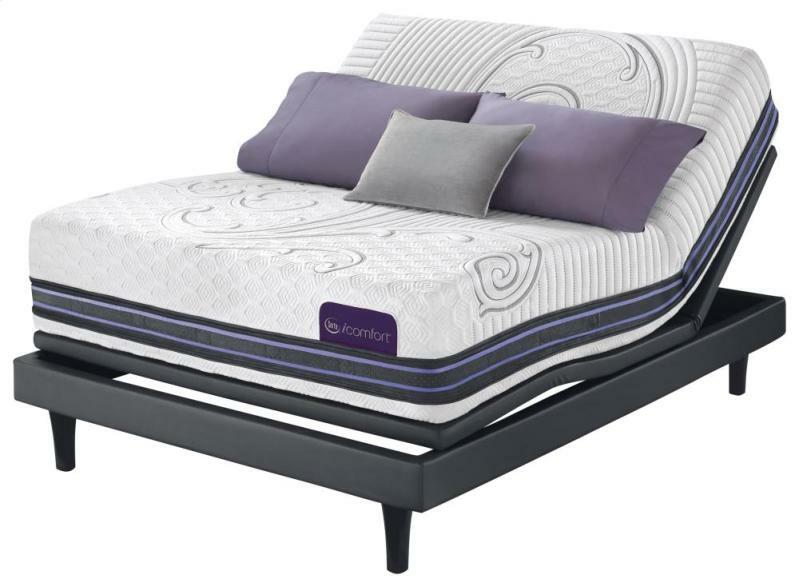 Combining their EverFeel Triple Effects Gel Memory Foam with the first-of-its-kind SmartSupport Memory Coil System, Serta comes through with a mattress that is nothing short of divine. This mattress provides a truly unique response, forming to your every curve and giving your body exceptional support while cradling you like the softest of down feather beds. Soft, and super-advanced, the iComfort could definitely be the bed you crave. The iComfort F300 is constructed with an exclusive memory foam – Serta’s EverFeel Triple Effects – that incorporates small beads of gel – millions of them! They contribute to your comfort by making pressure points a thing of the past, supporting your body in its proper alignment and keeping the bed’s overall temperature regulated. These gel beads mean you won’t toss and turn to find a comfortable position, and you’ll stay at a steady temperature throughout your sleep cycle. This supportive mattress allows you to sleep comfortably and awake refreshed, unlike other mattresses that create painful pressure on hips, knees, feet, arms, and elsewhere while you’re trying to snooze. When you sleep soundly, your body has a chance to heal itself, and this bed gives you all the comfort you need to sleep deeply and awake rejuvenated. The iComfort Sleep System is designed to respond to your specific needs, including support, temperature regulation, and individual comfort. This line of beds has been created with total comfort in mind. The iComfort F300 is on the cutting edge of the advanced sleep revolution, and benefits from several exclusive Serta technologies, including the brand-new EverFeel Triple Effects Gel Memory Foam and SmartSupport Memory Coil System. It also incorporates EverTemp Technology for exceptional temperature regulation. Its intelligent response to your needs makes it one of the most advanced sleep systems available on the market today. Not only is the iComfort F300 comfortable, it’s beautiful, too. The mattress is so gorgeous that you might not want to put sheets on it! The gentle cradling support is only highlighted by the fact that you can just toss yourself onto this bed as soon as you get it home (you know you’ll want to), no sheets needed! When you take this beautiful bed home, you can probably bet there will be at least a short nap on it before it’s even made. It’s just so soft and plush, and it feels amazing when your body stretches out and finally, you find out what it means to really be comfortable in bed. Mattress360 is a recognized leader in Glendale’s business community, and has been serving the Glendale, Arizona, area for more than a quarter-century. We have sleep consultants to help you choose the right mattress for your needs, and offer one of the best sleep-shopping experiences anywhere. If you’re looking for a top-quality Serta mattress, Glendale residents need look no further than Mattress360. With a 60-night price guarantee and 60- to 120-night comfort exchange, you can rest assured you’re going to love your new iComfort bed, or any bed you choose from Mattress360!